Description: African Universities Press, Lagos, 1975. First Edition, Paperback, Illustrated by: Mapa. Good/N/A.. Signed by Author. 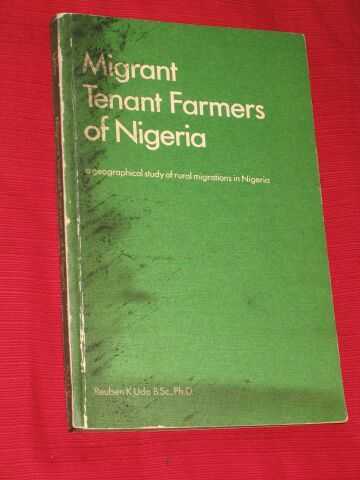 white titles spine & front on green covers, signed on title page by the author of this geographical study of rural migrations in Nigeria, some light wear to edges of spine & dark marks on front & rear covers near spine but internally clean & tightly bound, illust. by b/w. maps & diagrams, 154 pages incl. bibliography. Size: 8vo - over 7¾" - 9¾" tall. Illustrator: Mapa. Quantity Available: 1. Category: Geography & Maps; Sociology & Culture; Farming & Rural Life; Africa; Nigeria; Travel & Places. Signed by Author. Pictures of this item not already displayed here available upon request. Inventory No: SAF00076.